Edgar Degas’ The Rehearsal contains within its four corners almost every major theme that has ever been distilled from or assigned to the artist’s work on dancers. Four dancers are front center in the rehearsal room performing routine battement (a position in which one foot remains on the floor while the other is raised a little above the waistline). A group of dancers are situated behind them—one bent over, two gossiping with each other near a floor-to-ceiling window, one all alone at the barre, and one demurely clasping her hands as she regards her fellow dancers performing their exercises. A scene out of a dancer’s everyday life. There is in theory no mismatch between the common subject and loftier artistic platform, but one does exist as a matter of fact. And so, many have observed that Degas’ paintings of dancers ingeniously elevate the banal into the beautiful. The dancers rehearse in a room part gray, part brown, lit only by natural light from three floor-to-ceiling windows. Paint on the walls is old and peeling. Only one wall is equipped with a barre. Degas knew that the humble, urban condition of the studio was much more a part of the dancer’s craft and culture than the Palais Garnier where she performed. Hence the caption next to The Rehearsal at its home in The Fogg Museum of Art reads, “We see Degas’ concern with painting modern experiences, especially in urban settings.” And finally, we have word from Degas himself that he chose to paint dancers because he was fascinated by movement. Banality, urbanity, movement—all evident in The Rehearsal, but it seems less than satisfying to end the examination of the painting there, for these three can be found in almost any Impressionist painting. We would expect that Degas, with his unique subject and professed realism, brought something different to the table. Ballet, relative to other art forms, was an anomaly in Degas’ time. When new artistic movements were gathering steam—impressionism, realism, and romanticism at the forefront of the parade of isms—French ballet remained a bastion of classicism. Precision, poise, technical proficiency. These were the objectives of a French dancer. The body never out of position, the classical line held both figuratively and literally, the limbs always in alignment with fingers, feet, and head. In spite of its near-regimental formality, the classical method had a sort of alchemy to it—a way in which strict adherence to technique transformed craft into art. Classical purity faithfully fulfilled that one requirement of good art that seemed so elusive—true understanding of the art form. Virtuosity meant connecting with and personifying the art’s essence, becoming its ideal. Coldly classical, and yet innately balletic. But Degas operated in realism. There are hints of classical rigor here and there. A visible relic of a grid pattern and the fact that each dancer en battement is in exactly the same position indicates the use of studies and in-depth preparation before oil was applied to canvas. Indeed, Degas would often sketch drawings from life or photographs, transfer the images onto the canvas, and then modify them to comport with the work as a whole. In some cases, the last step was repeated several times as Degas scraped off parts of a painting and redid them, adding new characters or changing the setting. Meticulous craftsmanship is where the similarity with classicism stops, however, as Degas stuck to the realist credo of depicting life as it is without photographic accuracy. The lighting of the room is masterfully exact, the combination of dull palette and natural light from the windows providing the muted glamour of a ballet rehearsal. The dancers’ extremities are vague. Fingers are gnarled if at all visible. Faces of the dancers in the foreground are lightly sketched, but most have no face at all. Their limbs, the cradle of the arm where the elbow is slightly bent, the curve of the calf visible below the tutu, are delineated with special clarity. It is no accident that classical ballet also emphasizes these parts of the body. The one extremity that Degas has chosen to detail is the dancer’s foot, recognized by most as ballet’s trademark. The dancers en battement are given point shoes with little to no shadowing, indicating the foot is perfectly balanced within the shoe; the raised foot exhibits a perfect dancer’s point. Contrast that to the dancer at the barre, whose left foot is slightly leaning to the right while her leg stays straight, indicating imperfect balance. The slight curve of the shoe underneath the foot’s arch owes to the stiff shank supporting the dancer when she is en pointe. In the painting, the feet are as alive, if not more so, than the limbs. To have observed his subject so closely as to notice and accurately paint these details was more than enough to uphold the realist’s burden. Degas goes further. He leaves the ballet instructor out of the painting. Not all dancers are performing the same exercise, and most are not even rehearsing at all. The impression is one of instinctive order, something unnamed that produces uniform positions and progress despite seeming lack of focus on the task at hand. For the mature dancers in the painting, this would have been a natural and essential byproduct of years of training. On the other hand, these dancers are not mere slaves in the corps. The sashes around their waists are different colors, as are the ribbons in their hair; some opt for flowers in their hair instead, or curls rather than a traditional bun. Degas has strived to ensure the uniqueness of each dancer amid the obsession with uniformity, and with a simple game of dress up, he has succeeded. It is not a coincidence that the details Degas chose to include—those he deemed necessary for a realistic painting—are all core elements of French classical ballet. Concentration on the limbs and the body because the face only gets in the way. A corps made up of individual, distinct dancers who are recognized as such but move as one and do not draw attention to themselves. Discipline and muscle memory of position that can only be acquired through classical conditioning. Degas may not have shared the classicist’s devotion to unlocking essence through formal technique, but he has demonstrated virtuosity in realism through understanding the essence of his subject. Indeed, if The Rehearsal is more than a rendering of dancers in rehearsal, it is a meditation on the role of essence in classicism and realism, artistic movements on opposite ends of the spectrum. Granted, the two interact with essence in different ways—one seeks to find it within itself, the other seeks to paint its portrait. But they both ultimately speak in the language of essence; it guides them through their art, gives them an objective and a definition. When The Rehearsal is examined in conjunction with Degas’ other classroom paintings, the connection he draws between classicism and realism becomes stronger and richer still. All situated in the foyer de jour at the Hôtel de Choiseul, where the ballet corps of the rue le Peletier Opéra held classes and rehearsed, the first of the classroom paintings is believed to have been completed a few months before a fire destroyed much of the building’s interior in 1873. The last paintings in the classroom group were perhaps begun before the fire but were completed after when Degas could only turn to his memory and sketches for reference. Given this constraint, a lack of complete pictorial accuracy in his portrayal of the dance classes would be understandable, even expected. What is puzzling is that the physical and artistic attributes of the classroom vary from painting to painting. If this were due to memory, the works would at least be consistent with one another, even if a consistent departure from the actual look of the classes Degas sketched. So if not memory, what other explanation can we turn to? Artistic purpose is a good candidate, and one can sense an almost mischievous one here as the paintings appear near-documentary at the same time that they are coy and noncommittal about the characteristics of their subject. According to old floor plans and photographs, the foyer de jour measured thirty by twenty-five feet and had three floor-to-ceiling windows overlooking the Hôtel de Choiseuel courtyard, whose two large trees can be seen in The Rehearsal. In The Dance Rehearsal, the first of the classroom paintings, we learn that the interior of the room was divided width-wise by a row of heavy, wooden, round-sectioned columns and that at one side of the room, a dark stairwell surrounded by a handrail allowed access to the basement below. The lighting of the room is dark and muted, reminiscent of a winter day, due to the shadows from the columnade. In The Rehearsal, however, Degas opens the space up by taking away the columns and stairwell and adding warmer natural lighting. The floorboards of the two paintings run in opposite directions and their window jambs are of a different length. The best explanation for the discrepancies can perhaps be found in the fact that there were almost no discrepancies to speak of. 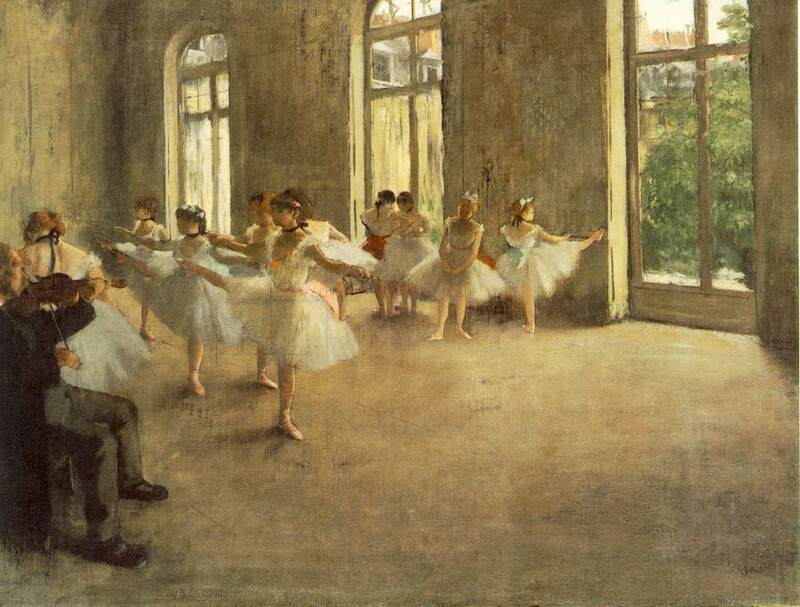 Recent x-ray and infrared examinations show that The Dance Rehearsal’s columns and stairway were originally included in The Rehearsal, only to be scraped out later by Degas. This did not mean that Degas believed the open space to be a better representation of the foyer, for the columns and dank lighting appear again in a later painting entitled Dancers Practicing in the Foyer. The final classroom paintings, however, follow The Rehearsal’s uncluttered setting and increase the brightness of its already serene, summery lighting. No photographs of the foyer can confirm either depiction as the more accurate one, nor would we want them to lest we be able to identify Degas’ transformation of reality in only a subset of classroom paintings. For in the end, the real fun of Degas’ classroom paintings is their proposition that we do not even need truth to have realism. We have no idea which of the foyers captures the characteristic of the actual foyer de jour, but we know that at least one of them, if not both, do not. And yet, we do not have any less faith in the realism of these paintings: they still give the impression of artistically rendered photographs, truly and accurately showing a moment from a dance class. Part of this faith comes from Degas’ grasp of and ability to render the essence of his subject. It also comes from Degas’ ingenious and cheeky insight that realism does not mean lack of artifice. It does not matter that the artist has taken great liberties with his subjects as long as they appear familiar enough to be recognizable. The illusion works precisely because of something classicism first discovered—that art is meant to be artifice. It is a game of suspension of disbelief, one which well-executed art will always win. Realist and classicist methods are not quite symmetric, though, in this area. Classicist art operates by its own rules, creating an entirely different world that is appreciated as such; if any relevance to our own world is established, it is done by our affirmative efforts. Much like their use of the concept of essence, classicism and realism take the fundamental building block of artifice and apply it to promote their own goals—one deceives plainly, the other more stealthily. How unexpected and eye-opening that scenes so mundane could be responsible for highlighting these intersections. For a realist artist painting classical artists at work, the connections could not have been more perfectly made. You are currently reading Edgar Degas’ The Rehearsal and Other Classroom Paintings at The Aleph Mag.